North Goa- The most vibrant part of Goa is known for its lively beaches, amazing mix of people and a lot of activities. If you are thinking of holidaying in Goa this season, we have shortlisted some really amazing North Goa hotels that are infused with comfort and cordiality. Let us take a quick peak at some of the best hotels in North Goa that assure you of an amazing stay! Vivanta by Taj, Panaji: A vibrant and ultra-modern hotel located in the state capital Panjim or Panaji, this contemporary property offers all luxuries to make your trip eventful. Being centrally located, it offers a delightful time to tourists who wish to explore the markets of Panaji and enjoy the beaches in close proximity. The hotel boasts of modern interiors complete with luxury amenities to make your trip worthwhile. You can regale in the comfort of spa and massage therapies offered by Jiva, in-house restaurants like Tamari, Latitude, Caramel, and Tease that offer world-class delicacies, well-appointed rooms and amazing hospitality. Enjoy a relaxed time in North Goa during your stay at Vivanta by Taj. Taj Fort Aguada Resort & Spa, Candolim: Centrally located to many popular beaches and hangouts, Taj Fort Aguada are a class-apart. A sprawling area with spacious rooms, interiors and breathtaking landscaping, this hotel exudes bespoke luxury. You can relish a variety of culinary delights at their quaint restaurants – Morisco, Il Camino, SFX, Martini bar, and Kokum Kitchen, regale on their private beach with a fantastic backdrop of a historic fort, and enjoy the amazing spread of rooms that are equipped with ultra-modern amenities to make your stay memorable. DoubleTree by Hilton Hotel Arpora Baga- An absolutely fantastic property located on the prime beaches of Calangute, Anjuna and Baga, it shares the most beautiful and picturesque setting to enjoy in Goa. With spacious Mediterranean style rooms, amazing hospitality, uber-modern facilities, this hotel is a travellers delight. Relish some culinary delights at their restaurants Flame, Caffeine and TAAL: Vegetarian Kitchen and Bar. Walk down to the famous Arpora Saturday Night Market, Club Cabana or Tito’s and much more. An amazing property and apt to make your trip complete, DoubleTree by Hilton is a gem amongst North Goa hotels. The Crown, Goa: A Goan boutique hotel located in the capital of Panjim, The Crown Goa is located on a hillock and offers a breathtaking view of the River Mandovi. Being centrally located, it provides easy access to various shopping markets, beaches, activity centres, restaurants and much more. The quaintly well-appointed rooms provide you with ultimate comfort with modern amenities to help you relax on your holiday. The hotel comprises of two restaurants- Hanging Garden and Harbour Café, which serve some typical Goan cuisine along with other types of delicacies. Come and enjoy warm hospitality and a completely stress-free holiday at The Crown Goa today. Resort Lagao Azul: A quaint resort is located in the vibrant setting of Little Baga in North Goa. The humble setup of the resort offers you with comfortable rooms and modern amenities to help you have a great holiday experience. The resort is equipped with a swimming pool, room service, in-house restaurant, complimentary breakfast, lounge, and much more. A perfect place to spend a romantic holiday or a vacation with your family, Lagao Azul provides you central access to many amazing beaches nearby. 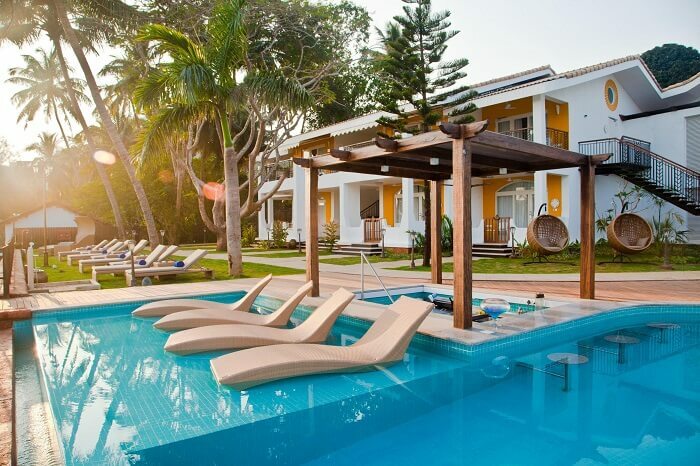 Aguada Anchorage – The Villa Resort: One of the finest villa resorts in Goa, Aguada Anchorage promises you an amazing time with your family and friends in Goa. Experience world-class staying experience with well-appointed rooms, all modern amenities most of them with private pools, and an absolutely gorgeous utopian setting to make you relax and enjoy. The resort comprises of 25 independent villas, ideal for large groups or families that want privacy, tropical trees, sprawling acres of lush greenery, and luxurious villas to make your holiday dream come true. Relish a meal or two at The Bridge, Schooner: The Pool Bar and Restaurant and in-room dining. Home away from home, Aguada Anchorage exudes luxury and comfort through every nook and cranny. Lemon Tree Hotel, Candolim: A quaint 4 star hotel located at stone’s throw from Candolim beach, Lemon Tree provides its guests a very contented holiday experience. Relish some delicious cuisines at Citrus Cafe, relax in their well-appointed deluxe rooms, luxury suites with a private swimming pool, hangout near their roof top swimming pool with terrace-top bar- Banyan Bar, enjoy complimentary breakfast, and warm hospitality to keep you comfortable throughout your stay. Get the best hospitality and an amazing holiday experience at some of the most magnificent North Goa hotels that boast of luxury, awesomeness and a gamut of surprises just for you. Come and enjoy a holiday with your loved ones in typical Goa style today.